I am pleased to announce that Boston Rare Maps will exhibit in Booth A6 at this week’s New York Antiquarian Book Fair, along with no fewer than 12 other dealers specializing in maps and atlases. Click below for a printable map of the Fair highlighting our locations. The Fair will run this Thursday March 8 through Sunday March 11 at the Park Avenue Armory in New York City. Hours are Thursday 5-9pm, Friday 12-8pm, Saturday 12-7pm and Sunday 12-5pm. Let me know which dates you plan to attend, and I will be happy to leave passes at Will Call. I look forward to seeing you there. 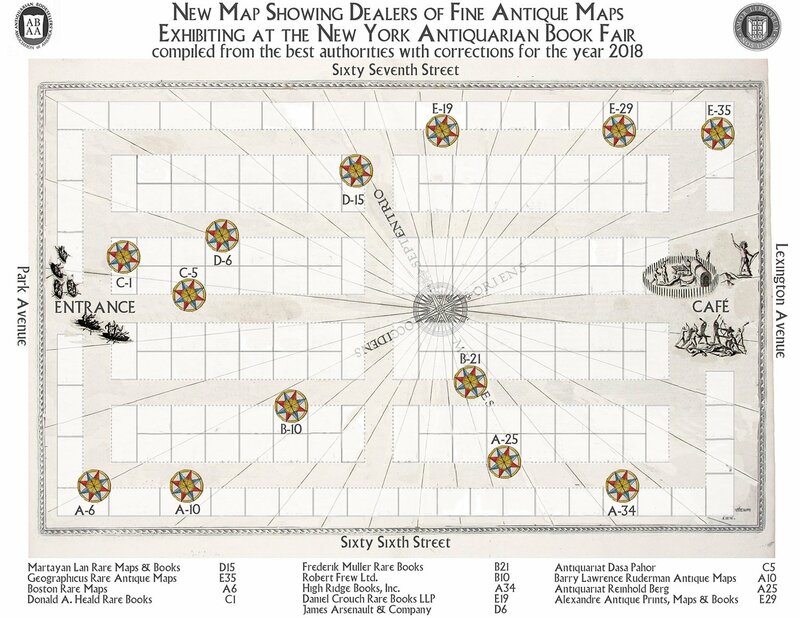 Click on the image below for a printable guide to atlas and map dealers at the 2017 New York Antiquarian Book Fair.